Not a month seems to pass any more without a major bank or hedge fund getting in hot water for using CDS in a way that was never intended, and now it's Goldman's turn, again. 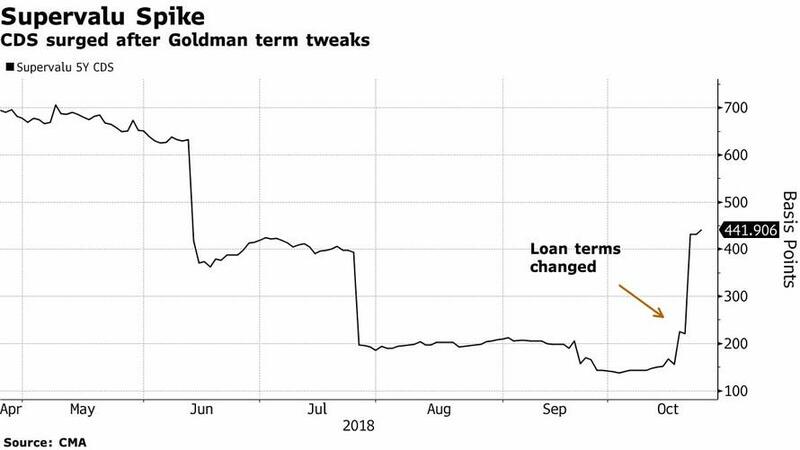 Three months ago, when the loan market was freezing up, Goldman struck an unusual deal with a group of hedge funds to offload a buyout loan from its books, saving the bank and the funds from potential losses. What was odd, is that Goldman was also serving as the underwriter to the company issuing the loans...while at the same time arrenging a "kicker" to loan buyers by having them bet on the potential insolvency of its own client. Now, this bizarre arrangement is at the center of a lawsuit accusing the Wall Street giant of gorging on fees while also exposing the acquirer in the buyout, United Natural Foods, to hedge-fund sharks who stand to reap major profits if the company collapses as a result of the incremental debt: according to Bloomberg, United Natural had hired Goldman Sachs for the takeover and is now demanding at least $52 million - and potentially much more - from the bank. “I have never experienced this kind of egregious and immoral behavior from a bank in my entire life,” United Natural Chief Executive Officer Steve Spinner told Bloomberg in an interview after his company filed the suit Wednesday in a state court in New York. Goldman, which until that moment had been retained by United Natural, vowed to vigorously fight the case, calling it "entirely without merit." As hinted above, Wall Street's latest drama once again revolves around the increasingly dysfunctional credit-default swaps market, where hedge funds and others wager on the ability of companies to keep up with their borrowings, only the traditional role of CDS as bankruptcy hedges has long ago given way to more "creative" applications. Indeed, as Bloomberg notes, "again and again, the contracts have played strange roles in debt transactions, sometimes straining allies or encouraging unlikely alliances." According to the lawsuit, Goldman adjusted the terms on a $2 billion financing deal in a way that allowed hedge funds to reap a windfall from their CDS bets, as first reported by Bloomberg in October. United Natural said it initially heeded Goldman's advice, agreeing to the changes so it could complete the takeover of grocery chain Supervalu. Where things got complicated, is that Goldman enlisted the help of hedge funds that had been betting on Supervalu’s demise. Those funds now stand to benefit if United Natural struggles to repay. That was just the beginning: United Natural also alleges that the bank unfairly withheld fees, burdened it with additional interest expenses and relied on “scare tactics” by a senior banker to back it into a corner. In the beginning it was nothing but rainbows and roses: United Natural, which is a supplier to Whole Foods, announced the $2.9 billion Supervalu acquisition in July, and with the market soaring and credit and loan spreads near all time tights, not a cloud appeared on the horizon. And, as so often happens, the company announced that Goldman Sachs would act as lead underwriter to sell the billions in debt needed to fund the deal. But just a few months later, as equities first tumbled and shortly thereafter credit markets - especially in the leveraged loan market - froze up, the investment bank faced the prospect of being saddled with millions in losses unless it found a way to offload the loan from its books. Meanwhile, hedge funds were facing major losses too after having bet against Supervalu’s debt by loading up on CDS, but the company’s sale threatened to create a situation known as an orphaned CDS contract, a situation similar to the infamous McClatchy fiasco (one which we profiled extensively in "Orphan CDS, Manufactured Credit Events, Insufficient Deliverables: What The Hell Is Going On In The CDS Market?"). Because new debt being issued to purchase Supervalu would have paid down the grocer’s obligations, it could have made swaps linked to Supervalu effectively worthless - referencing an entity with no significant borrowings - even as the default risk of the purchaser, United Natural, soared. However, due to the specific nature of the CDS contract, there was no continuity in tracking the referenced entity, as such those who were betting on a Supervalu default would end up with nothing, even if the successor company did eventually file for bankruptcy. It is here that Goldman had an "epiphany", one which would kill two birds with one stone. The key was to restore the value of the roughly $470 million of net CDS wagers linked to Supervalu’s debt. While the cost of the Supervalu derivatives had plunged through most of last year, by tweaking the loan docs to make Supervalu a co-borrower on the new financing, Goldman sparked a surge in the value of the swaps. That, along with several other concessions, not only rescued hedge funds from getting wiped out on their SVU CDS, but more importantly, helped Goldman fill its order book for the loan and eliminate its exposure risk. And while Goldman was the clear winner here, helping a couple of millionaire credit PMs avoid major losses for 2018 while avoiding taking a loss on its buyout loan exposure, United Natural claims that Goldman left it exposed to a group of lenders whose interests are at odds with its own and who are motivated to create roadblocks aimed at forcing a default so that they can notch further gains in the CDS market. That may be difficult to prove, especially since Goldman can claim that without the contract fudge, the deal may never have been funded. Still, United Natural alleges that it never received a final list of funds participating in the loans and, had it known, would’ve raised concerns, even though without making the concessions to hedge funds, Goldman would have struggled to place the deal. What Goldman apparently did not explain is that the one entity most on the hook - in terms of both P&L and reputation - was Goldman. Which is why Feldgoise and Bank of America, to co-lead arranger on the loan, are also named as defendants. As Bloomberg concludes, it’s another twist in Feldgoise’s time at Goldman Sachs, which ironically, included a stint as chairman of the firm’s global fairness committee. Curiously, in mid-2017, division chiefs announced he would be departing the bank, stepping down from his post in senior management to become an advisory director. Yet he’s still at the bank, now in a heated battle with a client for whom he’s handled various deals. That said, with the millions in fees from the United Natural-Supervalu deal, at least Feldgoise's tenure at Goldman is secure. Worst case, he can always get a job at one of the many hedge funds that made a killing on SVU CDS thanks to the Goldman fudge.